More than 3,500 Americans die each year in fires, and approximately 20,000 are injured. Deaths resulting from failed emergency escapes are particularly avoidable. Having a sound escape plan will greatly reduce fire deaths and protect you and your family’s safety if a fire occurs. Practice escape plans every month. The best plans have two ways to get out of each room. If the primary way is blocked by fire or smoke, you will need a second way out. A secondary route might be a window onto an adjacent roof or a collapsible ladder for escape from upper story windows. Purchase only collapsible ladders evaluated by a nationally recognized laboratory such as Underwriters Laboratory (UL). Make sure that windows are not stuck, screens can be taken out quickly and that security bars can be properly opened. Also, practice feeling your way out of the house in the dark or with your eyes closed. Security bars may help to keep your family safe from intruders, but they can also trap you in a deadly fire! Windows and doors with security bars must have quick release devices to allow them to be opened immediately in an emergency. Make sure everyone in the family understands and practices how to properly operate and open locked or barred doors and windows. 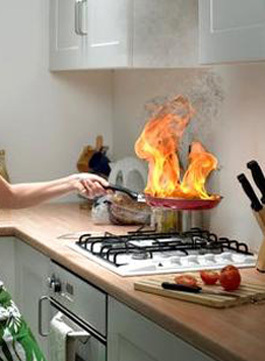 When a fire occurs, do not waste any time saving property. Take the safest exit route, but if you must escape through smoke, remember to crawl low, under the smoke and keep your mouth covered. The smoke contains toxic gases which can disorient you or, at worst, overcome you. When you come to a closed door, use the back of your hand to feel the top of the door, the doorknob, and the crack between the door and door frame to make sure that fire is not on the other side. If it feels hot, use your secondary escape route. Even if the door feels cool, open it carefully. Brace your shoulder against the door and open it slowly. If heat and smoke come in, slam the door and make sure it is securely closed, then use your alternate escape route. Designate a meeting location away from the home, but not necessarily across the street. For example, meet under a specific tree or at the end of the driveway or front sidewalk to make sure everyone has gotten out safely and no one will be hurt looking for someone who is already safe. Designate one person to go to a neighbor’s home to phone the fire department. Remember to escape first, then notify the fire department using the 911 system or proper local emergency number in your area. Never go back into a burning building for any reason. Teach children not to hide from firefighters. If someone is missing, tell the firefighters. They are equipped to perform rescues safely. Finally, having working smoke alarms installed on every level of your home dramatically increases your chances of survival. Smoke alarm batteries need to be tested every month and changed with new ones at least once a year. Also, consider replacing the entire smoke alarm every ten years, or as the manufacturer guidelines recommend. Donations to the Department can be made through The United Way by simply writing in Mathews Volunteer Fire Department on your United Way Pledge Form.